I’m a big fan of HubSpot. I’m literally a “fan” of HubSpot — a Facebook Fan. But I’ve noticed something unsettling lately. I see their Promoted Posts in my News Feed every day. Not just a different post every day. It’s usually one of the same posts over and over promoting their eBooks. They technically may not be Promoted Posts. They could simply be ads created to promote their posts that target multiple places, including News Feeds. Semantics, but it needs to be said. This promotion, in and of itself, isn’t terrible. As a Fan, I don’t care. But they are getting a ton of negative comments on these posts as a result. Here’s a post that was written on November 12 and is still regularly in my News Feed. It’s received 334 comments. Of those, 33 are public complaints that this is spam. Oh, and guess how many comments from HubSpot? It’s pretty obvious which posts have been promoted — or promoted heavily. They’re the ones with the most comments and a ton of complaints. Typically link shares instead of photos. Like this one. Or this one. Or this one. They also tend to be flooded with spam and nonsense comments. A bit ironic, I guess. Other HubSpot posts generally get fewer than 10 comments. This is odd since the Page has over 380,000 Facebook Fans. But I’m not a fan of how HubSpot is going about their advertising. Sure, you can target your Promoted Posts at Fans and Fans Plus Friends of Fans. But that doesn’t mean you should do it. As you can see from the results above, people freak out if they see something in their News Feeds that doesn’t belong there. If you don’t want to be reported as spam, you should be sensitive to this. If I were HubSpot, I would target these News Feed ads at Fans only. Not only would they reach the people who would most likely care about the post, but the costs would be lower and they’d get fewer spam reports. They’d also get fewer spam and nonsense comments, which are pretty bad on the posts they promote heavily. That doesn’t mean that friends of Fans are off limits. To the contrary, they are the first non-Fans whom you should target. But not in the News Feed. Or at least not excessively. Yes, you can get some great results when utilizing the News Feed for friends of Fans. But I’m not convinced it’s worth the risk. Facebook users expect to see content from brands they are not connected to in the sidebar. Use that real estate! People are very territorial about their News Feeds. While I’m not turned off by Promoted Posts, I don’t speak for all Facebook users. Don’t abuse them. Once again, this doesn’t mean you shouldn’t use Promoted Posts. You should use them so that you reach Fans with important content that satisfies business goals. I use Promoted Posts to assure that I reach more of my Fans who aren’t online when I post. Such a promotion generally hits the same person only once. But you shouldn’t hit the same person’s News Feed a dozen times with the same post. Even Fans will have their limits. Finally, take a cue from the comments within your post. If you’re getting bombarded with complaints, adjust. If you’re getting flooded with spam, adjust. HubSpot is throwing caution to the wind. They’re ignoring the comments. It shows with their actions that they do not care. I’m picking on HubSpot here, but it’s not just them. I’m seeing more and more of this — not only the excessive promotion in News Feeds, but the negative backlash. As advertisers, we need to be sensitive to this. There is a balance. You wouldn’t stop email marketing altogether if you were getting a ton of unsubscribes and spam reports. You’d adjust the frequency of your messaging. 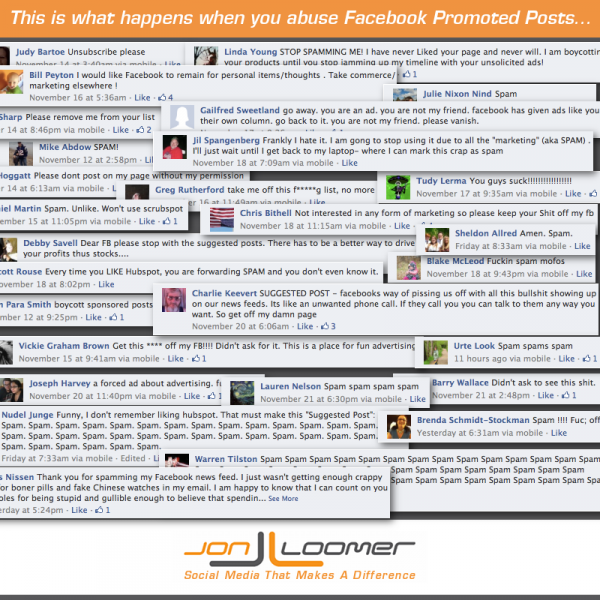 Are you seeing brands abuse Promoted Posts? Are you noticing more negative comments as a result? How does this impact your approach as a brand?